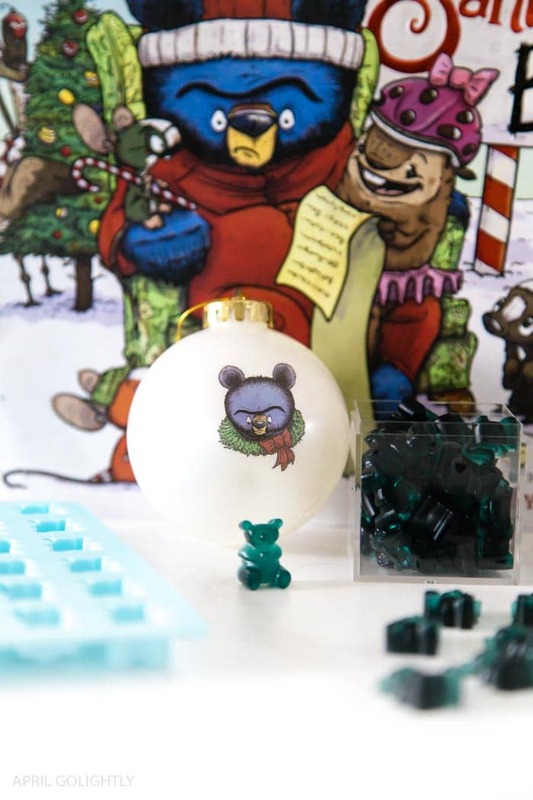 This Santa Bruce Gummy Bear Recipe and Post is sponsored by Disney Book Group. All opinions are my own. My daughter loves reading Christmas books all year long. Santa Bruce is one of our new favorite books and is officially in the daily book rotation. My husband and I share bedtime duties and have a stack of books that we read our daughter every night before she goes to bed. Did you know that it is now required that we read to her 20 minutes per day per the teacher’s request? Do you have that at your school? Of course, we were already doing at least 20 minutes of reading at night. Now, we are upping our reading time to include daytime reading sessions that are more interactive since our daughter is starting to read a little on her own now! Yippy! The new Santa Bruce book, in stores now, is part of the famous Mother Bruce series by Ryan T. Higgins. It is pretty funny and a pleasure to read because Bruce is a grumpy lovable bear. He is a pretty decent cook and he is a mother. One thing Bruce is not – Santa Claus. Buy the Santa Bruce Book here. But that doesn’t stop the whole forest from lining up to give him their Christmas wishes when he becomes the victim of mistaken identity—again. My daughter cracks up every time that I read Santa Bruce! My daughter absolutely loved the ornament and is getting excited about putting up the Christmas Tree. Ryan T. Higgins (ryanthiggins.com) is an author and illustrator of Santa Bruce and Mother Bruce series. He likes the outdoors and cheese sandwiches. Also, he is NOT a grumpy old black bear, but he DOES like making books about one—starting with the best-selling Mother Bruce, which received the E. B. White Read-Aloud Award and the Ezra Jack Keats New Illustrator Honor. He lives in Maine with his wife and kids… and too many pets. Since I perfected the collagen gummies recipe, she has been asking for me to make them every day. Also, she loves helping me fill the gummy bear trays. While we were reading Santa Bruce, I decided to order a gummy bear mold with an eye dropper instead of just making cubes. Cubes are so boring for kids!! The silicone gummy molds with the eyedropper make this homemade gummy bear recipe kid-friendly. It is much easier to get the gummies out of silicone bold because you can pop them out by pushing them out from the back. I have made a ton of different gummy bears and almost any juice works as a base for the gummy bears. My favorite is watermelon juice and grape juice so far. My least favorite is orange juice, but the recipe still works. Try making these homemade gummy bears with any juice that you have in the house. How to Make Gummy Bears? In a small pot, bring one cup of juice to a boil. Add in the two tablespoons of maple syrup and the 1/4 teaspoon of blue food coloring. Lower the heat to low and add in the two tablespoons of the Beef Collagen Gelatin one scoop at a time and whisking as you add the powder into the liquid. Once the powder is dissolved, take the mixture off the heat and allow to cool for about 10 minutes. Pour the liquid into a hearty mug or jar to make it easier to use the eyedropper. Lay the gummy bear sheet onto a cookie sheet to help keep the gummies stabilized when you put them in the fridge. Use the eyedropper to add the liquid into the gummies one at a time doing your best not overflow the gummies. Also, try to avoid getting bubbles in your dropper. You can get let them rise in the dropper by holding it upright. Also, you can pop them carefully if they do get into the molds. Place the gummy bear mold in the fridge on top of the cookie sheet for 30 minutes or until they are solidified. Use the eyedropper to add the liquid into the gummies one at a time doing your best not overflow the gummies. Also, try to avoid getting bubbles in your dropper. You can get let them rise in the dropper by holding it upright. Also, you can pop them carefully if they do get into the molds. Grab your own Santa Bruce Book here. Happy reading! !